Welcome to our assortment of traditional medieval arrowheads. We carry various designs andstyles, to ensure that whether you are collecting or looking for arrowheads to construct or repair your own arrows we have exactlythe arrowhead you need. Please note that each of our medieval arrowheads is sold as only anarrowhead for replacement or as a collectors item and are not a complete arrow. We have a selection spanning medieval history ranging from the intriguing Drillpoint Head to the classic Anglo-Saxon Broadhead. This Anglo Saxon Broadhead is hand crafted in mild steel. 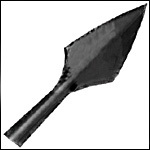 Historically, these types of medieval arrowheads have successfully been used for hunting large game, including boar. Our historic Medieval Broadhead has been copied from real medieval arrowheads. Hand forged and functional, these arrowheads are available in a black polished finish. Our historic Medieval Arrowhead has been copied from real medieval arrowheads. Hand forged and functional, these arrowheads are available in a black polished finish. Our historic Medieval Bodkin has been copied from real medieval arrowheads. Hand forged and functional, these arrowheads are available in a black polished finish. This Chippenham Type 1 arrowhead is hand crafted in mild steel. Length: 3 inches, breadth: 0.8 inches. Our historic Medieval Devises Swallowtail arrowhead has been copied from real medieval arrowheads. Hand forged and functional, these arrowheads are available in a black polished finish. Our historic Medieval Curved Broadhead has been copied from real medieval arrowheads. Hand forged and functional, these arrowheads are available in a black polished finish. This Chippenham Type 3 arrowhead is hand crafted in mild steel. This Large Anglo-Saxon Broadhead is hand crafted in mild steel. Historically, these types of medieval arrowheads have successfully been used for hunting large game, including boar. The Curved Broadhead, Large, Type 14 was used for hunting large game such as deer or bear. In war, it was used to shoot the horses to cause severe bleeding and immobility. Our historic Straight Broadhead has been copied from real medieval arrowheads. Hand forged and functional, these arrowheads are available in a black polished finish. Our historic Medieval Tanged Arrowhead has been copied from real medieval arrowheads. Hand forged and functional, these arrowheads are available in a black polished finish. Our historic Medieval Arrowheads have been copied from real medieval arrowheads and are all hand forged and functional. These Medieval Leafblade Arrowheads are available in a polished finish. Our historic Medieval Arrowheads have been copied from real medieval arrowheads and are all hand forged and functional. These Medieval Serrated Leafblade arrowheads are available in a polished finish. This Small Medieval Curved Broadhead is hand crafted in mild steel. Historically these types of medieval arrowheads have been used for hunting large game such as boar or deer and would give a deeper cut than a straight broadhead. This Roving Head Medieval Arrowhead is hand crafted in mild steel. This Small Straight Broadhead Type 13 is hand crafted in mild steel. This type of medieval arrowhead was used for hunting small to medium game and was also used in the Medieval Battle of Bosworth. Our historic Tanged Forked Head has been copied from real medieval arrowheads. Hand forged and functional, these arrowheads are available in a black polished finish. Our historic Medieval Type 7 Needle Bodkin has been copied from real medieval arrowheads. Hand forged and functional, these arrowheads are available in a black polished finish. Our historic Medieval Type 12 Triangular Bodkin has been copied from real medieval arrowheads. Hand forged and functional, these arrowheads are available in a black polished finish. Our historic Type 13 Small Straight Broadheads have been copied from real medieval arrowheads and are all hand forged from high carbon steel and come unsharpened. These arrowheads are available polished to a metal finish. Our historic Medieval Type 6 Forked Head has been copied from real medieval arrowheads. Hand forged and functional, these arrowheads are available in a black polished finish.